5 - 5,5..........Vello von Fürstenfeld. 5 - 5,5..........Kira von Romberg. 5 - 5.............Dixi von Krakau. Overall Build: Powerful; thick soft fur; good colour and markings; correct skull, sufficiently strong underjaw; eyes deeply-set and medium-brown; long and sufficiently firm back; slightly sloping croup; sufficient front and good rear angulation; inharmonious gaiting, overall sufficient firmness. Nature: Calm, open and sure. Very high protective instinct and fighting spirit, very high courage and hardness with middle sharpness. Bo von der Mooreiche passed the Körung 'for life' with highest possible rating for hardness and working drives (very high for protection, courage, hardness and fighting drive with middle sharpness). Her litter-sister, Björi von der Mooreiche, placed fourth at the D.V. Meisterschaft in 1988 with 287 points. 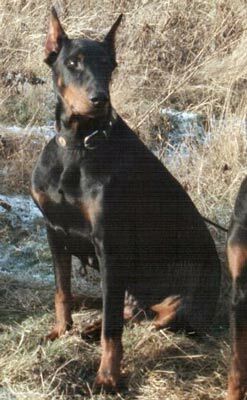 Bo's sire, Akim von Vaciweba, competed in the D.V. Meisterschaft and passed the Körung 'for life' with highest rating for hardness and working drives while her maternal grand-sire, Bingo von Ellendonk, was the winner of the D.V. Meisterschaft in 1977 and passed the Körung 'for life' with highest rating for hardness and working drives. Hassan: SchH 3 and passed the ZTP with 1A rating for character and SG for conformation. He is sire of the von der Hollerburg “F” litter (Falco). Hektor: SchH 3, DV-DM participant and passed the ZTP with 1A rating for character and SG for conformation. Hexe: SchH 3 and passed the Körung with Körklasse 2B rating. She is dam of the vom Strundertal “B, E” litters (Bess, Erik).